A writer for the Washington Times was recently in Belize for a relaxing vacation and unwittingly found herself helping preserve Belize’s Barrier Reef by hunting and killing Lionfish. Sadie Dingfelder says while she was staying in Placencia she was invited on a night whale shark watching expedition, and during the expedition she found out about the invasive Lionfish. 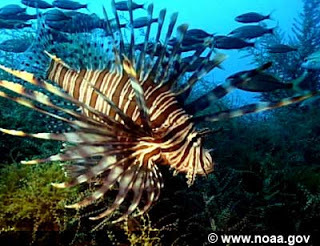 The Lionfish, which has been wrecking havoc from the shores of Maine to the Florida Cayes and all through the Caribbean, was first discovered in Belize in 2002. These fierce predators are indigenous to the Pacific and Indian Oceans and were accidentally introduced to the Atlantic in the 1980’s. When Dingfelder heard about how destructive these invaders are to the reef, she agreed to go on a “Lionfish hunting expedition”. On the hunt she manages to spear one Lionfish while hear guide speared about six more, which they brought back to her hotel to cook for dinner.